A standardized rating system was develop, first in Europe and than adopted by many USA laminate flooring manufacturers. This can help you decide which laminate floor styles will best meet your needs. The AC ratings measure impact resistance, abrasion resistance, burning and staining resistance and are broken into 5 AC rating categories. For most household situations AC3 or higher is preferred. AC1 and AC2 should only be used in low traffic areas. Laminate floors can be installed over most subfloors, including concrete slabs and some existing floors. They can also be used on all grade levels and in any room. Although, they are not meant to be used in high wet areas such as bathrooms. This is why some customers prefer laminate flooring, because they can use them in areas where a real hardwood or a tile may not be recommended for use by the manufacturer. All this sounds great, doesn't? And it is… but, not all brands are equal nor are all laminate floors within each brand the same in thickness, quality, price, or performance. 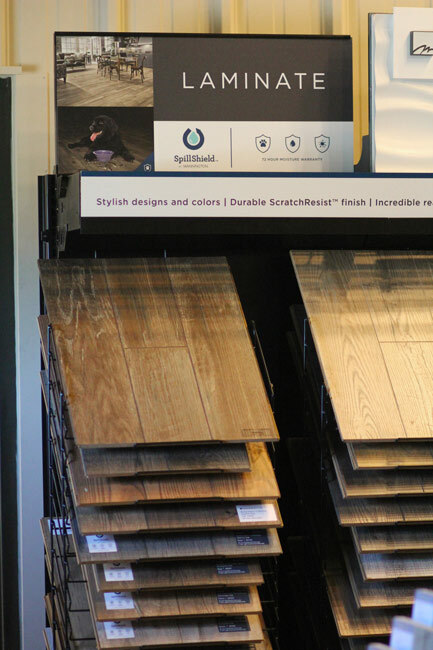 We offer specially selected laminate flooring brands that will fulfill your specific needs and we stand behind all of our products. For example, some of floors we offer will stand up to large pets and lots of traffic activity while other floors have exquisite design details and unbelievable realism both in texture, feel and appearance. We also offer laminate flooring for the energetic, do-it-yourself person that is looking for an economical laminate floor that won't empty their pocketbook.